Once on the road again, the trio considers using a temple as a way station. This reasonable plan is foiled by an unrelated Romeo and Juliet incident; the temple is unavailable because it is being used for the funerary rites of a pair of star-crossed lovers from rival families. The fugitives will need to look elsewhere. Fortune hands the group a solution in the form of a brothel suffering an infestation of insect pests. As it happens, one of sorcery’s mundane applications is pest removal; Penric trades the convenient eradication of the unwanted insects in return for which he asks only a place for the trio to stay for a short while. This buys the group enough time to consider their next move. The Cedonian authorities are looking for two men and a woman. Solution: pose as two women and a man. In short order Penric finds himself attired and made up as a reasonably attractive woman. Conveniently for Penric, thanks to Desdemona he can draw on the experience of Desdemona’s previously hosts. One, Mira, was the courtesan Mira of Adria. His pose is very convincing. There’s just one minor complication: Chadro, one of the brothel’s clients, is infatuated on sight with the comely sorcerer. Chadro is a Cedonian officer, precisely the sort of person whose attention the trio must avoid. But he is bound and determined to pursue his courtship. When Penric and company leave for the border, love-smitten Chadro sets out in hot pursuit. This follows directly on Penric’s Mission. It might be best read as the second part of the adventure rather than as a standalone work. Whereas Penric’s mission involved thrills, danger, horrifying torture, and massive trauma, this is decidedly much lighter in tone. There is danger: the Cedonian faction that targeted General Arisaydia could at any moment find them. There’s no telling how violently Chadro might react if he ever finds out that charming Mira is in fact Penric. Still, just as Some Like It Hot was a comedy despite the homicidal gangsters, this is (mostly) a comedy. Now for a conversation between author and editor. James: I found this instalment kinda meh. It doesn’t make sense at all without the previous novella. I had quite liked Nikys when I first met her, but she seemed oddly muted in this novella. I’m also wondering why Bujold seems to have a thing for widowed love interests (Ekaterin, Istra, the Cordelia of Gentleman Jolie). Editor: I, on the other, enjoyed the heck out of this novella. I was amused by Penric’s assignation with Chadro, who would not be denied a night with the brothel’s latest attraction. A four-poster bed, a handful of scarves, and Penric gives Chadro a night of ecstasy without ever taking off his clothes or smudging his makeup. Though I really really wondered how Penric made it last that long. They must teach that in advanced courtesan classes. As for the widows … James, Bujold is an older woman. She is making a point of writing heroines who aren’t seventeen-year-old ingenues. As an older woman myself, I appreciate that! James: I am guessing that Penric had some sorcerous help when pleasing Chadro. 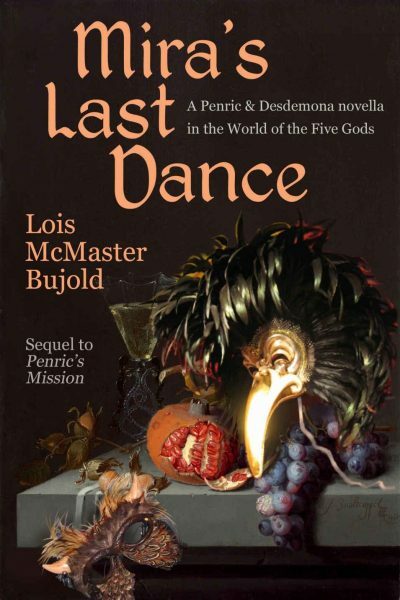 Mira’s Last Dance is available here (Amazon). It is not available from Chapters-Indigo, although the audio-book is.